I often get asked, "what's your favourite restaurant in Bath?'" or, "where would you suggest I/we dine in the city?" Since moving to Bath in the summer of 2013, Scott and I have tasted our way across a number of restaurants and cafés here. But Bath is home to a vast foodie scene - there are c.400, and counting, so we still have some way to go! However, there have certainly been stand out dining experiences that I would readily recommend. Step away from the main thoroughfare of Milsom Street and head towards the corner of John Street. Once there, you will spot a sign for Olé Tapas, which resides snugly between its two neighbours: Paxton & Whitfield (an award-winning cheesemongers that has a Royal warrant) and Firehouse Rotisserie (popular for its spit roasted rotisserie chicken). The moment you walk through the door and up the set of stairs to the restaurant floor above, you will be welcomed by an utterly charming team of Spanish waiters and waitresses. Be ready to listen (or sing!) along to their lively soundtrack of Spanish music - cue: Olé, olé, olé! Don't be surprised if your waiter starts belting out foreign lyrics with great enthusiasm (and talent, I may add! ), clapping and bopping along to the music from behind the bar. You can be sure there will be no dull moments whilst you dine here! It's not hard to see why this 10-12 table restaurant is so very popular with Bathonian's and tourists alike. 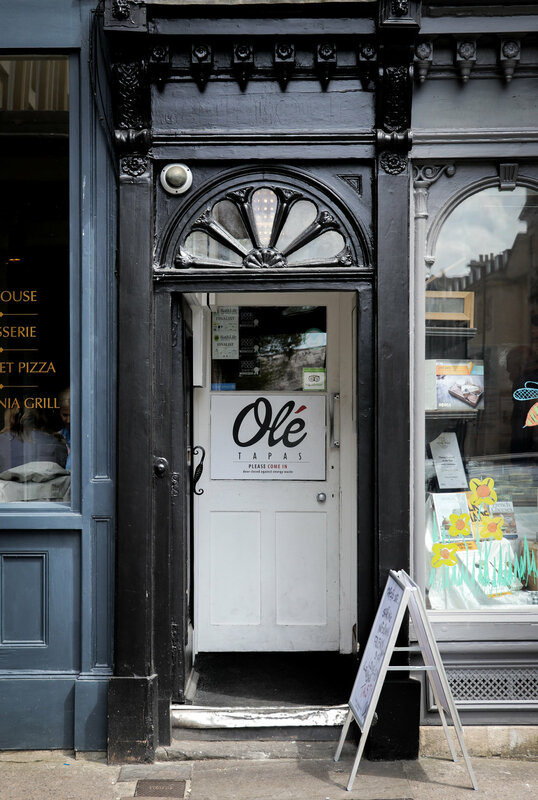 Olé Tapas is currently #17 out of 435 restaurants in Bath on TripAdvisor, and has clearly built up an esteemed reputation for its fantastic food, ambience and service. Let me share with you then, the reasons why you will be wanting to book a table here, pronto! 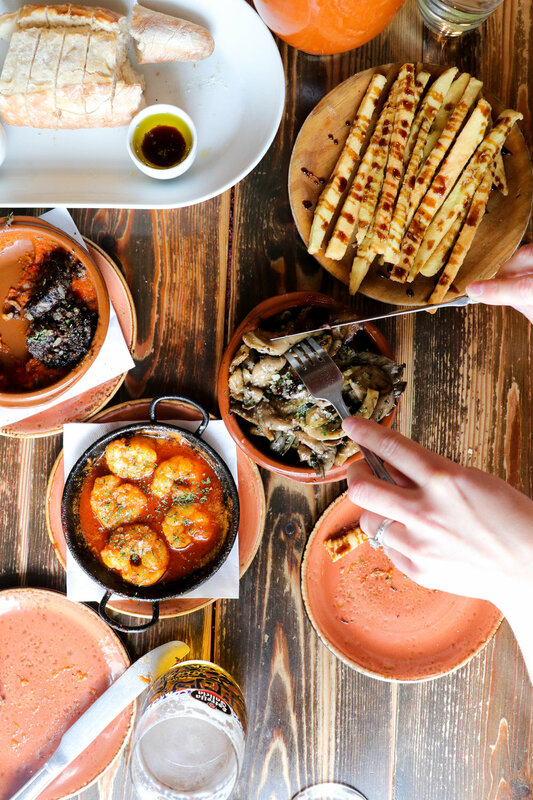 Firstly, you have to love Spanish tapas... Count us all in! Beginning with 'Pan Con Aceite y Vinagre' (£4.50) that's home-baked bread served with extra virgin olive oil, a cabernet sauvignon vinagre and ali-oli. The bread was still piping hot from the oven and pillowy soft. Here we have the 'Morcilla Con Tomate' (£4.95) - grilled Spanish black pudding in a homemade tomato sauce. As well as 'Setas A La Plancha' (£5.95) - grilled wild oyster mushrooms with garlic olive oil. We also sampled the 'Gambas Pil Pil' (£7.95) - peeled tiger prawns cooked in extra virgin olive oil, garlic and chilli. As well as the 'Berenjenas Fritas' (from the Specials menu) - tempura of aubergine with dark Spanish honey from Malaga. 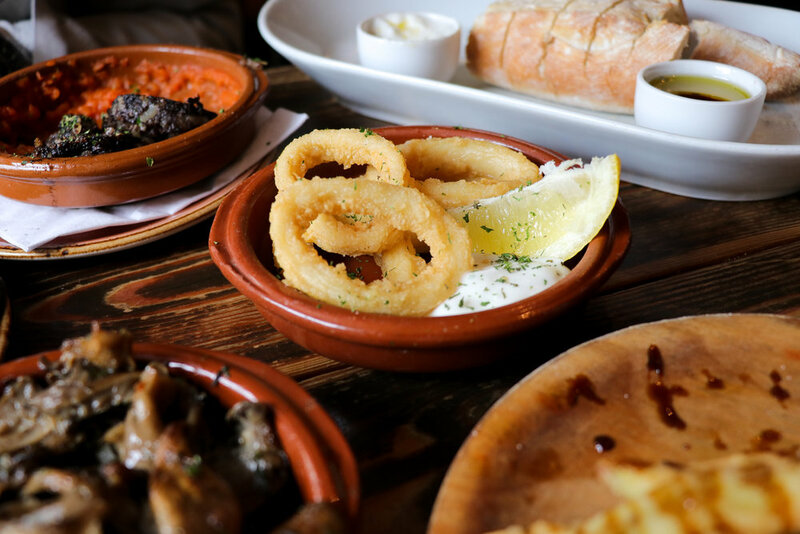 Not to mention the 'Calamares A La Andaluza' (£4.95) - deep fried squid with homemade ali-oli and 'Carne A La Plancha' (£6.95) - grilled mature Spanish heritage beef. Now to pick a favourite? That's a tricky one! It was clear to see (and taste) that every dish had been cooked with such love, care and attention. 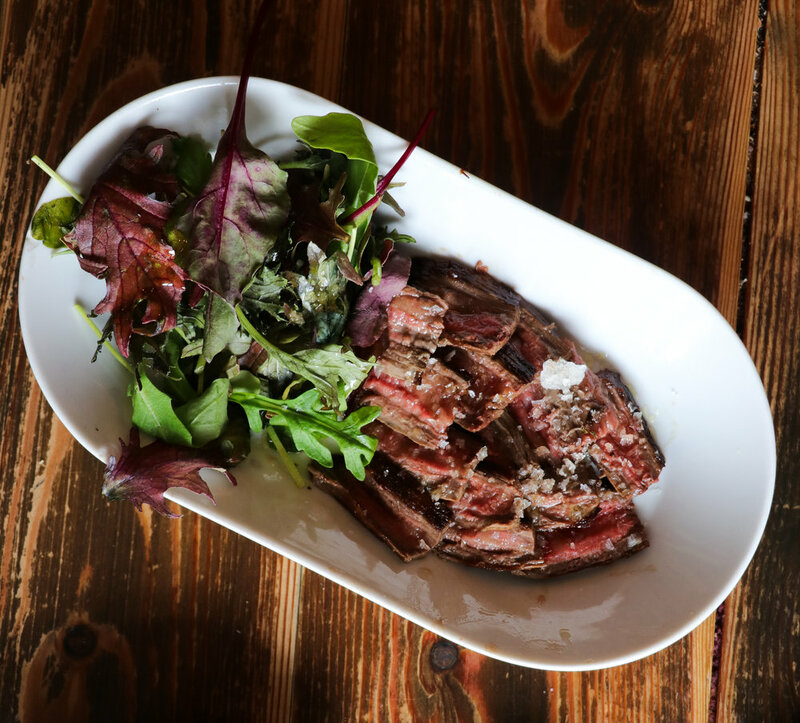 The flavours were absolutely mouth-watering from start to finish, and, our only comment out of all of the dishes would be that the heritage beef had too much rock salt for seasoning, for our likening anyway. Our lovely waitress stopped to show us a board of 'Tabla Mixta' (£23.95) - a selection of cured meat and cheese with bread sticks, destined for a table nearby. The perfect sharing platter which we will definitely be ordering on our next visit. After our savoury dishes, our heads turned to the dessert menu and, thanks to the waiting staff, a sweet tipple to end our meal too. But not just one tipple each! Dessert shots followed the dessert wine too! And finally... irresistible 'Churros Con Chocolate' (£4.95) - deep fried churros with hot chocolate sauce. Plus, the rich and gooey 'Leche Frita' (£4.95) a typical Spanish sweet dough served with sugar glaze and cinnamon. Oh yes, by this stage I was thinking that I should certainly be planning a trip to the gym that evening! We simply cannot wait to return soon, and will be doing so with whoever plans a visit to see us in Bath next! ;) Expect a whole heap of tasty Spanish tapas and sangria, because Olé Tapas is where we will be heading, mis amigos! This post is with thanks to Olé Tapas who invited us over to review their menu. The fantastic staff who wined and dined us and entertained us with their Spanish songs and dance moves, we will be back! Muchas Gracias!